I've been in an embossing mood lately. It started with trying to replicate some Michelle Zindorf cards. I am no brayer master but I enjoy trying. Anyway I wanted to pair my Cornish Heritage Farms tree background stamps with the tree trio from Through the Trees. Black and Red were my school colors growing up and I'm rather partial to the combo. Of course I think kraft looks great with everything (I use almost as much kraft as I use white!) so the colors were easy for me to pair up. I started by stamping the tree background stamp in Going Gray ink on kraft paper. After the ink dried, I stamped the tree trio in versa mark, then black ink and heat embossed black powder to give it a really black look. 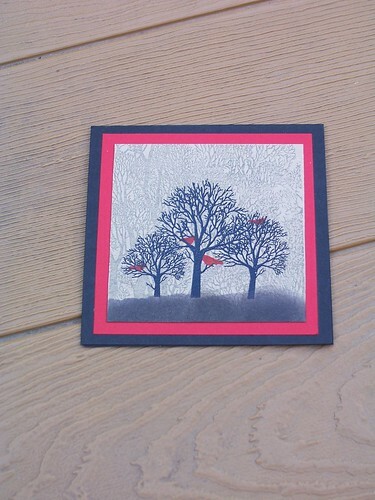 I finished the image by stamping some of the birds from Through the trees in red. Since the ink will not stick to the embossed areas, it gives the impression that some of the birds are in the middle of the trees.